Panoramic view of Jerusalem's Old City and the Temple Mount. The Dome of the Rock, the building with the golden domed roof, in the center. The map shows Israel, officially the State of Israel, a country in the Middle East with a coastline at the Mediterranean Sea in the west. Jews, Christians, and Muslims regard the region as the biblical Holy Land. Israel is bordered by Egypt, Jordan, Lebanon, Syria, and the Palestinian territories (West Bank and the Gaza Strip;) it shares maritime borders with Cyprus. The borders with Syria (Golan Heights), Lebanon (Shebaa farms) and the Palestinian territories (declared as the State of Palestine) are still disputed. With an area of 22,072 km², the country is slightly larger than half the size of Denmark, or somewhat larger than the US state of New Jersey. Israel has a population of 8.95 million people (Nov 2018), spoken languages are Hebrew and Arabic. 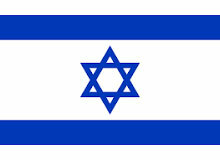 Designated capital is Jerusalem, the country's largest and most populous city. However, Israel's sovereignty over Jerusalem is internationally disputed. The country's second largest city is Tel Aviv; it is Israel's economic capital; the city is host to almost all foreign diplomatic missions, embassies, and consulates in the country. Ben Gurion International Airport (IATA code: TLV) near Tel Aviv is the largest and busiest international airport in Israel, Ovda Airport (IATA code: VDA) in the southern Negev desert is Israel's second international airport. 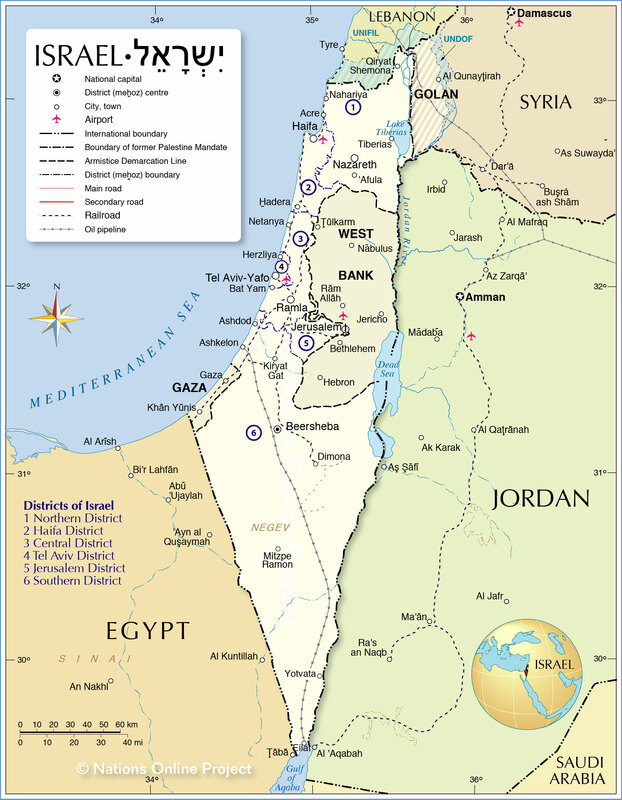 Map shows Israel and the surrounding countries with international borders, district (mahoz) boundaries, district capitals, major cities, main roads, railroads, and major airports. You are free to use above map for educational purposes, please refer to the Nations Online Project. Acre (Akko), Afula, Ashdod, Ashkelon, Bat Yam, Beersheba, Eilat, Hadera, Haifa, Herzliya, Jerusalem, Kiryat Gat, Mitzpe Ramon, Nahariya, Nazareth, Netanya, Ramla, Tel Aviv, Tiberias, and Yotvata.